Playing the minor ii V i progression is an essential skill for any jazz guitarist, and this progression is often seen by jazz guitarists as being derived solely from the harmonic minor scale. However, as with many musical concepts, there are standard alterations that are often used to make things sound sweeter to Western ears. If you’ve read up on your music theory, then you will know that this chord progression is called a ii V i because you are using the 2nd, 5th and 1st chords from the underlying scale in the given key you’re playing in. In the case of a minor ii V i progression, you use the harmonized harmonic minor scale to build these chords (hence the term minor ii V i). To explain this concept further, and make the idea a bit clearer, let’s take a look at the chord theory behind the minor ii V i progression in terms of the harmonic minor scale. Play through this scale on the guitar to get a feel for how it sounds, as it is the basis for the minor ii V i progression. The chord built on the first (i) note (degree) of the scale is a mMaj7 chord. You may not have been familiar with this chord until now, but you can think of it as a three-note minor triad (D F A) with a major 7th added (C#) on top of that triad. The V chord, otherwise known as the dominant 7th chord, is A7. 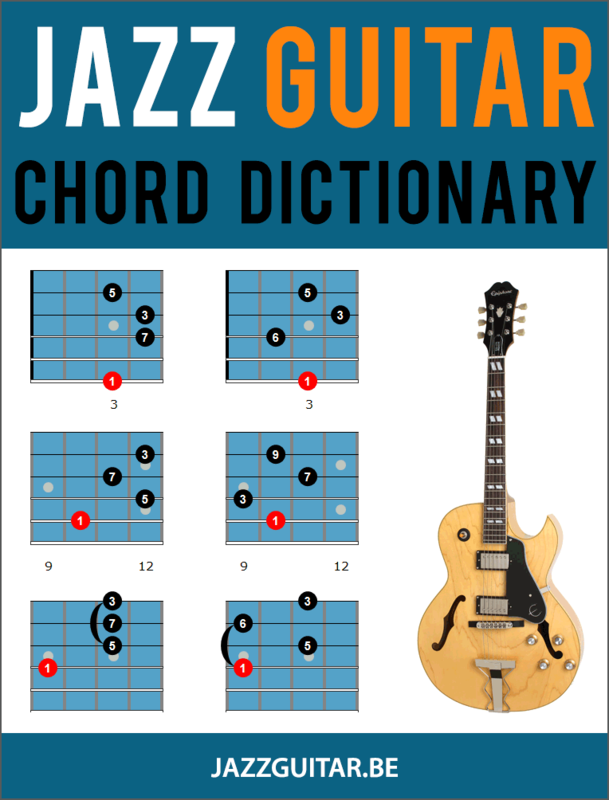 To begin, check out this useful barre chord form on the fingerboard. This is a minor ii V i progression in its purest form. To give it its full description in detail for each chord, the chord progression is ii(m7b5) – V(7) – i(min/maj7). This is quite a mouthful, so you normally just use the phrase “Minor ii V i” to describe the above sequence of chords. Notice that for ii and i we use lower case roman numerals. It is a convention in music to use lower case to denote minor-type chords and upper case to denote major-type chords, hence ‘V7’ not ‘v7’. When you play through this chord progression, do you notice that the DmMaj7 chord sounds tense and quite unresolved Normally the tonic chord in a progression acts as a kind of musical full stop, but this inherent tension in the mMaj7 chord does not really allow for that. Often musicians do not use the mMaj chord as a resolution point in a chord progression. You do see the mMaj7 chord used, but if I were to guess I’d say that it is only used about 20% of the time. The majority of minor ii V i chord progressions will normally substitute a ‘straight’ minor or minor 7 chord for the tonic mMaj7 chord. One notable composition that does use the mMaj7 chord as a resolution to a minor ii V i progression is Solar, by Miles Davis. The soloing challenges over the minor ii V i progression that I have mentioned, all revolve around the fact that the final Dm7 chord does not come from the same ‘parent’ D harmonic minor scale that the ii and V chords derived from (If you remember, we were expecting a mMaj7 chord). This means that we may have to adjust our thinking slightly when we are soloing over the Dm7 chord. For now, make sure you are able to play the chords along with a backing track. Play each chord on the downbeat of the measure. Next, play the chords on beat 1 and 3 of each measure. From there, play the chords on beat 2 and 4 of the bar. Lastly, try the Charleston rhythm from the example below to spice things up a bit. Before checking out the next section, make sure you can change cleanly between the chords in time with a slow, medium and fast backing track. A common mistake that many guitarists make when learning minor ii V I soloing, is to begin their study from a scale point of view only. Early jazz language was developed on marching band instruments such as trumpets and clarinets. These instruments are well suited for playing fast musical lines based around arpeggio figures, and so to develop your understanding and aural awareness of the genre, bebop should be always approached from the perspective of arpeggios, not scales. You will now learn the appropriate arpeggios that fit over each successive chord in the minor ii V i progression. Notice that the solid dark red dots in the arpeggio shape form the Em7b5 chord that you learned in the previous section of this lesson. Again, here the solid red dots are from the A7 chord you learned previously. You will again see that the solid red dots are the chord shape you have learned, and the arpeggio notes are all built around that shape. Begin on the square root note and ignore the notes on the bass string for now. Let’s start by getting familiar with the chord to arpeggio relationships. Start by playing the chord as shown with the red dots and then play the related arpeggio. Do this with all three chords. When you are close to having all three arpeggios memorized, try the following exercise with a backing track. You are going to play just the root of each chord/arpeggio while the backing track is playing. While this exercise may seem simple at first, knowing and hearing where your root is is essential when it comes to strong soloing and developing your ears. Try this again this with the notes in each bar reversed so you are playing the higher octave root first. In this position, there are root notes over three octaves in the A7 arpeggio. Can you find them? Try reversing the note sequences in each bar so that you play the 3rd first, and then the root. Next, play the same intervals but in the higher octave. Remember to reverse the notes here too so you play the higher octave 3rd and then the root. Exercises like these are vital in teaching you how to begin your lines from notes other than the root. They increase your vision and aural awareness of the guitar. Again, try practicing the reverse order of the notes in each bar so you play the intervals 5th, 3rd, root, and then repeat both exercises in the higher octave. Finally, you’ll play all four notes of each arpeggio: the root, 3rd, 5th, and 7th. Play these patterns in the higher octave too and if you run out of notes, just double back on yourself. The ability to play the appropriate arpeggio tones over each chord is a big stride towards mastering any bebop tune or chord progression. Not only are your guitar skills improving with these exercises, but your ears are improving too. View this stage as learning where the strong notes of the progression lie. If you can always hear them and find them on your guitar you will always be able to resolve any line that you are playing if you trust your ears. Just play the 7th of each chord. Just play the 5th of each chord. Play the 3rd and then the 7th (first in low octave then in high octave finally play both notes together as a chord). Play the 7th and then the 3rd. Play the arpeggio tones in the order 3, 5, 7, 1. Play the arpeggio tones in the order 5, 7, 1, 3. Play the arpeggio tones in the order 7, 1, 3, 5. Play the arpeggio tones in the order 7, 5, 3, 1. Play the arpeggio tones in the order 3, 1, 7, 5. Stay with these exercises until you are very comfortable with at least the first 5 in the above list. A professional guitar teacher for over 15 years, Joseph graduated from The Guitar Institute in London with a Diploma in Popular Music Performance. He continued his education at the prestigious Leeds College of Music achieving a BA (Hons) in Jazz Studies in 2002. After graduation, music has taken Joseph all over the world. He is currently living back in Thailand and is busy teaching a new wave of upcoming guitarists via Skype lessons and running the online Guitar Resource Site, Fundamental Changes. I tweaked this progression a little in my new piano composition. I’ve learned a lot from you about jazz and I appreciate your simple and enlightening explanations. I found this all very interesting. I understand your explanation of how the minor ii V 1 comes from the harmonic minor scale but, as you say the i chord sounds more like an augmented, unresolved chord more allied to a V7. Why does the minor ii V I derivate from the harmonic minor scale and not the Dorian for instance? This would give us Em7 A7 (OK we’d have to add C#) and Dm7. Hey David, the C# is the reason a minor ii V comes from the Harmonic scale. There is no C# in D Dorian or D Aeolian, so there’s no dominant chord on the V, but a minor chord. Thank you for sharing.Beautiful musical building blocks.These treats are the legos of musical lyric.Madrigals of the muse. Levine does indeed note that the harmonic minor scale is often mentioned in theory books as being “a scale played over a minor II-V-I.” He refutes this statement on the basis that the statement simply doesn’t hold water as, in point of fact, the great players don’t generally play it other than over V7 b9 chords resolving to a minor chord a 5th below. Same question as Dave. Several other jazz authors recommend using three different Melodic minor scales over minor ii V i. Assuming both methods are correct, why choose Harmonic minor scale. Oh man. I would love an answer to these last two questions. I need to sit down and transcribe players I like to hear it for myself. Has anyone down this and have at least songs or passages they like that use one or the other approaches?